Over forty members of the Australian Artists Association gathered on Wednesday, 10 March 2010, for an informal dinner at Chez Olivier, 121 Greville Street, Prahran. It was a wonderful occasion for the members of the Association to reconnect with each other while sampling the delicious cuisine of Olivier’s French kitchen, washing it down with French wines. The dinner was also an occasion to introduce to the members of the Association the owner of the restaurant, Olivier Normandin, an entrepreneur, wine connoisseur, and art philanthropist. 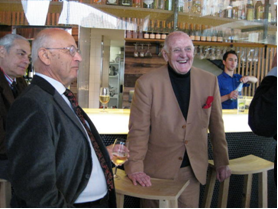 We have also hosted a luncheon for John Olsen, who was recently in Melbourne for the official launch of The Olsen Hotel in South Yarra. 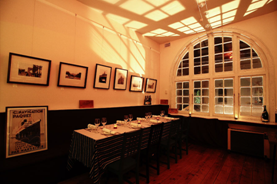 The luncheon took place at the hotel’s BlueBottle restaurant, and was likewise a most entertaining get-together for the members of the Association and other artists. According to the feedback we have received, the above-mentioned events were enjoyable occasions, so we would like to endeavour to host such dinners or luncheons on a bi-monthly basis at a variety of locations. In order to give each dinner certain individuality and focus, we would also endeavour to invite regular special dinner guests from other art organisations and associations, as well as visiting artists, curators, and philanthropists whenever an opportunity arises. The next dinner will take place on Wednesday, 23 June 2010, at 7pm – time, place, and the guest speaker to be confirmed. 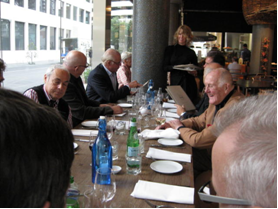 A few years ago we started hosting regular drinks for the members of the Australian Artists Association at the Blue Diamond Bar in the CBD and Candy Bar in Prahran. Sadly, it did not prove to be as successful as we have hoped, and the numbers of the attendees have dwindled. However, recently there has been a call to renew these regular informal gathering. Our wonderful friends at the Art Series hotels have invited us to resurrect this tradition at the BlueBottle at The Olsen on the second Thursday of every month from 7pm onwards, starting from June 10th. We realise that Thursdays are usually popular nights for exhibition openings – so join us at the BlueBottle once you’re “arted out” for a drink and chat with fellow members and other artists (or even dinner). After a certain hiatus, we will be resuming our annual gala events. In the past, these were high-profile dinners or luncheons, at which the presentations of the Painters and Sculptors’ Association Medals were made to some of Australia’s most significant artists, who the Executive felt were deserving of the honour. Past recipients included Roger Kemp, Lloyd Rees, Margaret Olley, John Olsen, John Coburn, Charles Blackman, Judy Cassab, Robert Juniper, Arthur Boyd, and Louis Kahan. At the last Board meeting of the Australian Artists Association, the Board members discussed the need to continue these popular and high profile events, though with a different format. It has been suggested that a cocktail style event with a guest orator would be more suitable for our revamped organisation. We are pleased to announce that the Australian Artists Association has secured a major sponsorship from the Art Series Hotels and its parent company, Asian Pacific Building Corporation. In addition to this, as a member of the Australian Artists Association, you can now enjoy 15% discount off accommodation rates at any Art Series hotels – The Cullen on Commercial Road, Prahran, as well as The Olsen on Chapel Street, South Yarra, or The Blackman which opens its doors in August on St Kilda Road, Melbourne – by booking your accommodation through the dedicated members’ only area on the Art Series hotels website – www.artserieshotels.com.au/aaa. Art Series hotels provide guests with a unique experience. Each hotel is named after and inspired by famous Australian artists. No two Art Series hotels are the same. The first to open was The Cullen in November 2009. This $48 million dollar boutique hotel in Prahran is named after the artist Adam Cullen. Home to 115 rooms over six levels, it boasts stunning views from rooftop penthouses, and includes two restaurants and a hair salon. The flagship property is The Olsen ($90million), which was officially launched in April 2010. Named after one of Australia’s most celebrated living artists, John Olsen, it is set within Melbourne’s premier shopping hub, Chapel Street. The 14-story building, designed by architects Rothelowman, features a draped canvas like façade, which encloses 229 refined rooms, a day spa, two restaurants, and a glass bottomed swimming pool overhanging Chapel Street. Every hotel features a major artwork commissioned especially for the hotel foyer from the naming artist, including Adam Cullen’s Ned Kelly Series in the foyer of The Cullen, and six metre mural, Golden Sun over the Yarra River, set in the spectacular glass foyer of The Olsen. Archival prints and a photographic history of the artist’s life adorn walls of rooms and public spaces of the hotels, while the architecture, interior design and style personify and reflect each individual artist. The Australian Artists Association (AAA) was formed in 1984. 2009 marks our twenty fifth anniversary! In contrast with our early period of focused politicking, the past few years have been relatively quiet for the organisation and we have kept a low profile. However, rumbles of change are afoot! As you may recall the AAA was originally established as a lobby group representing the needs of professional artists. Our initial challenges included lobbying the Minister for the Arts in relation to artists donating artworks and working closely with the National Association for the Visual Arts (NAVA) and Arts Law on submissions to Government and the Tax Office. Our efforts spanned subjects such as the GST, the PAYG system, losses from non commercial activities as well as the unique nature of carrying on business as an artist. In addition to our lobbying role we have also assumed the role of a peer group body, paying tribute to a number of artists for their outstanding contribution to the arts by awarding specially designed medallions at a series of celebratory presentation events (past awardees are: Roger Kemp, Lloyd Rees, Margaret Olley, John Olsen, John Coburn, Charles Blackman, Judy Casaab, Robert Juniper, Arthur Boyd and Louis Kahan). Feedback tells us that such social events are popular and regarded as an important catalyst for the creative community as well as valuable public exposure for the AAA membership. Over recent months the AAA Board met and discussed directions for the organisation, seeking ways to revitalise and update the relevance of membership. We are keen to hear from our members and value your input into AAA’s future directions, so please email us at info@australianartistsassociation.org.au and feel free to air your ideas with us. For your convenience, you can download an annual member’s application form from this page – and we hope that you will sign up and join us for an exciting year ahead.